It was the name that first caught my attention: The Pink Pepper Tree. Hotels on Mallorca don’t usually have English names. I’d seen the hotel featured in a newsletter from Spa in Spain, as the venue for a four-night yoga holiday. But you don’t have to be a yogi to enjoy a stay here, as we discovered. The small hotel is part of an old finca dating from 1570. It’s located on the outskirts of the small town Lloseta, towards the village of Alaró, and has a gated car park. The facilities of Lloseta (which include the excellent Santi Taura restaurant and a theatre) are within walking distance. The Pink Pepper Tree opened only in 2015 and has eight en suite bedrooms; one on the ground floor is adapted for people with disabilities and has a small private terrace. Described on their website as ‘your home hotel’, the property is run by a lovely couple who, despite not having run a hotel before, have warm hospitality running through their veins. It’s surely impossible not to feel at home here. Glynn and Jacqueline are the friendly hosts. Jacqueline Rozenhart is Dutch and her partner Glynn Jones is from South Africa. He studied architecture and worked as an interior architect and, after moving to Holland, worked in furniture design. Jacqueline, who radiates calm, had wanted to have a retreat. Glynn didn’t like the North European weather; although the couple thought about moving to South Africa, it didn’t feel like the right place to be. 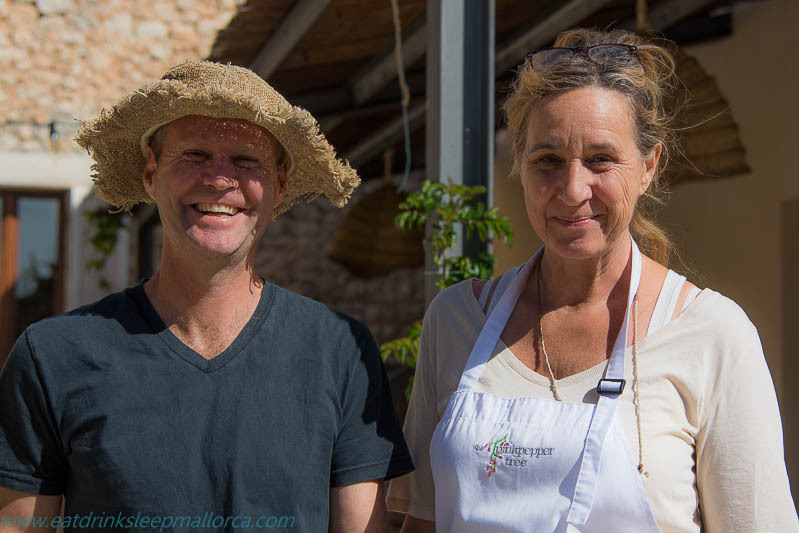 They came to Mallorca, where they eventually found this finca in Lloseta with Glynn’s brother, who lives in Poland; the couple renovated it whilst living in nearby Alaró. Upcycling was a key element in decorating and fitting out the hotel, which features many examples of the couple’s creativity and artistic talents. Glynn, in particular, likes working with wood and his skills are in evidence here. There are lots of quirky fun touches, as well as contemporary art by Jacqueline and wooden sculptures made by her partner. A clever way to create hanging space in a room using traditional old Mallorcan chairs. Straw donkey heads mounted on a canvas, in the dining area. More of Jacqueline’s art. ‘Bon profit’ is the equivalent of ‘bon appetit’. The hotel has plenty of outdoor space where guests can relax, including the terrace with a variety of seating and lounging options around the large saltwater pool. The new garden the couple planted is maturing and includes an organic vegetable plot and fruit trees. The Pink Pepper Tree has an ‘A’ rating for its energy consumption: water is solar-heated, and sensors in the corridors mean that lights are on only when needed. The pool, with just some of the lounging furniture. Surprisingly comfortable chairs. Other seating includes hammocks and a rocking chair. Glynn showed us up to our room for the night and I actually gasped with pleasure when I saw it for the first time. As well as the double bed against an exposed-stone wall, it had a curvy freestanding bath in the wooden-floored bedroom area. Separately, there was a walk-in shower cubicle (rainwater-style fitting which worked very well), loo, and an iron staircase leading up to a mezzanine with a single bed. The high ceiling incorporated a Velux roof window for additional light (and a view of startlingly blue sky that day). Art by Jacqueline over our bed. Note the attractive typical exposed stone walls that are a feature of the hotel. The bath in our bedroom. The rooms have all the facilities you’d want, including radiator heating, air conditioning, tea- and coffee-making facilities, complimentary still water, and high-quality natural toiletries from Mallorca company Gaia Natural Products. Bathrobes and beach towels (for use by the pool) are provided. There’s free Wi-Fi (which worked properly) and a flat-screen TV (which we didn’t use). Beds are comfortable, with fine Egyptian cotton bed linen. Guests can make themselves comfortable in the cosy lounge area, which has a wood-burning stove in the corner. Another area has shelves laden with books; and there’s a small bar built around a tree trunk. As fans of Illy coffee, we were pleased to see the Illy machine here. Coffee table made by Glynn. 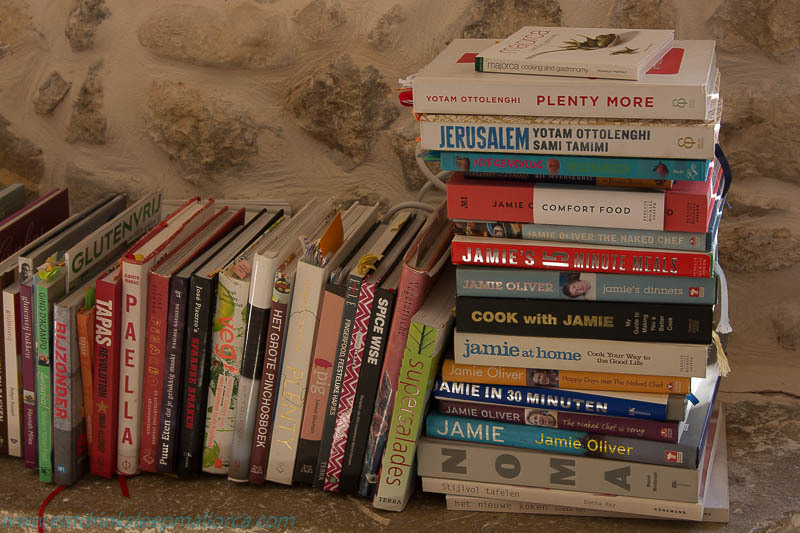 Jacqueline cooks dinner on Mondays, Wednesdays, and Fridays, for guests who want it. There’s an additional charge of 27,50 euros for a three-course surprise menu, using produce from their organic garden where possible. We were there on a cooking night, and opted to try Jacqueline’s cooking. Main course of sea bass and roasted new potatoes, green beans, mangetouts, purple carrots, and salad with a dressing made with lemons from the garden. Sweet potato brownie (surprisingly good) with dates and walnuts, with strawberries marinated with chia seeds and pink peppercorns. Wines are mainly Mallorcan, with a few from the Peninsula. We chose a rosado called Supernova 2014 from Can Verdura – one of Mallorca’s smallest wineries. For nights when Jacqueline isn’t cooking, Lloseta is home to a few restaurants, including the excellent Santi Taura and, within that restaurant, another one called Dins by Santi Taura. Jacqueline and Glynn have plenty of other dining-out suggestions to offer for those who want to venture a little further. In fine weather, you can have breakfast outdoors (as we did) in the courtyard area in front of the hotel. The continental buffet-style breakfast is available from 9am; Jacqueline will cook eggs to order for guests who’d like them. We helped ourselves to fresh fruit, yogurt, cold meats, cheeses, and warm bread, rolls and croissants. Glynn brought us good Illy coffee and delicious freshly squeezed orange juice. What was once an old barn has been converted into a ground-floor studio for yoga and space for massage treatments (these can be arranged with 24-hours’ notice). A local yoga instructor comes to give classes here. 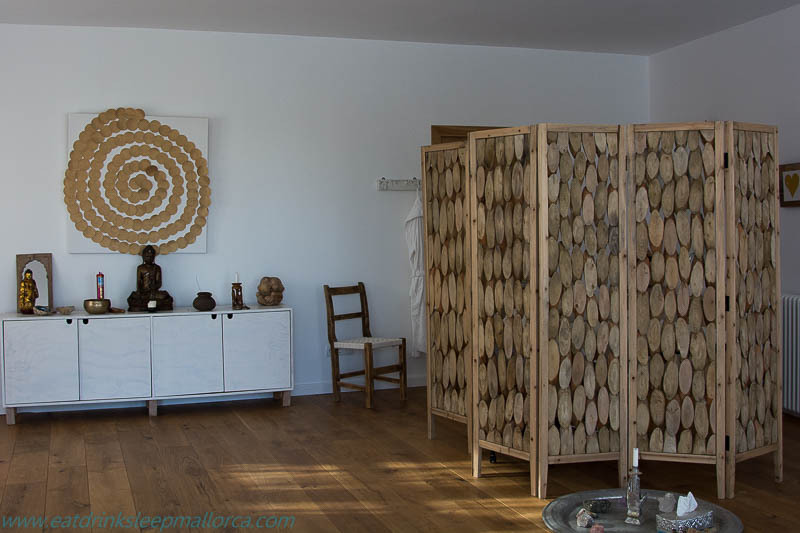 Space for yoga and treatments. This ‘home hotel’ attracts plenty of repeat guests and we plan to become two of these. Whether or not you practise yoga, The Pink Pepper Tree is a hotel where you’ll find a warm welcome and a feeling of being at home. And the name is easy to remember – and pronounce – too.